Have you ever tried to assemble IKEA furniture without the instruction manual? Sure, maybe it seemed like it would be easy enough…until you found yourself surrounded by half-assembled pieces and no idea what you’re supposed to do with that extra bag of screws. Plus, now your partner is questioning your competency. That’s why, before you embark on any project, it’s a good idea to start with a plan. A project plan is an essential document for keeping a project on track. In your project plan, you identify the scope, goals, deliverables and deadlines of your project. What is the purpose of this project (what problem is it going to solve)? What will the timeline be, including deadlines? Who will be on the team for this project and what role will they play? What resources are required to complete this project? The problem is, people dive into writing a project plan without understanding its purpose, the importance of its various sections, or doing any required reading and preparation first. Your project plan needs to be organized, focused, readable and engaging enough to hold the attention of your team. Not sure where to start? 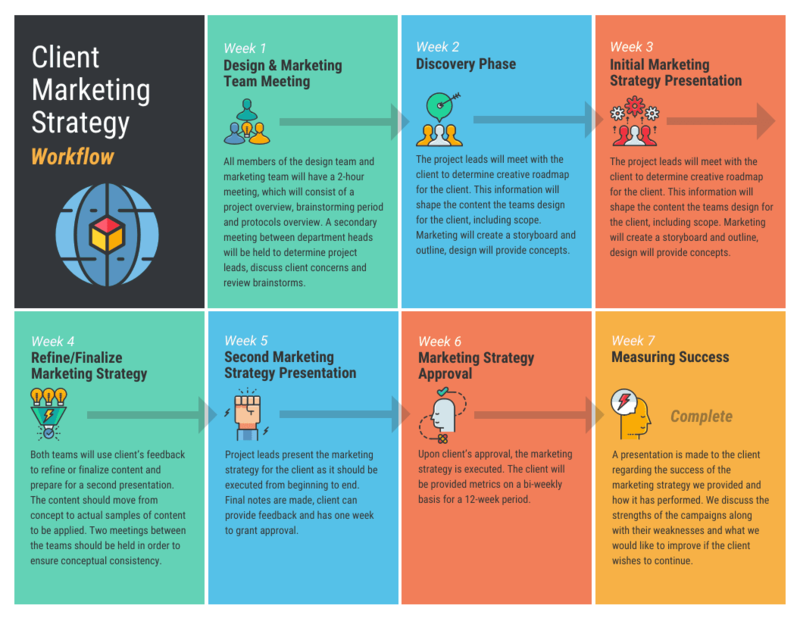 This guide will offer you tips for designing an engaging project plan–along with a bunch of creative project plan templates that you can use. 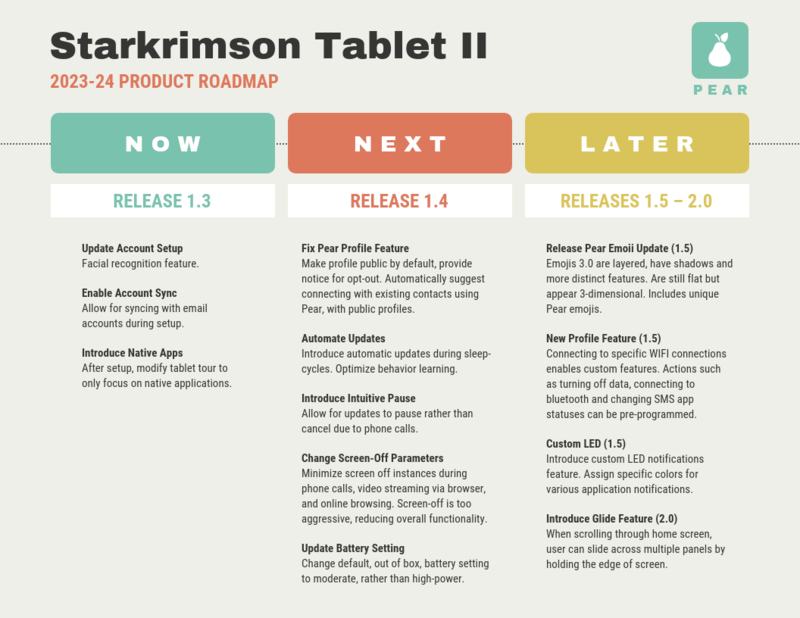 Why not just make a roadmap in Excel or Word and call it a day? Well, you could, but the end result will be pretty lackluster. Also, most project plans aren’t set in stone. They’re agile documents that will probably have to be adjusted along the way. That’s why it’s best to use a more flexible project plan template. You’ll have an easier time editing it, and there will be more opportunity to give it an engaging design. If you’re unsure of how to approach putting your plan together, a project plan template can be a big help. 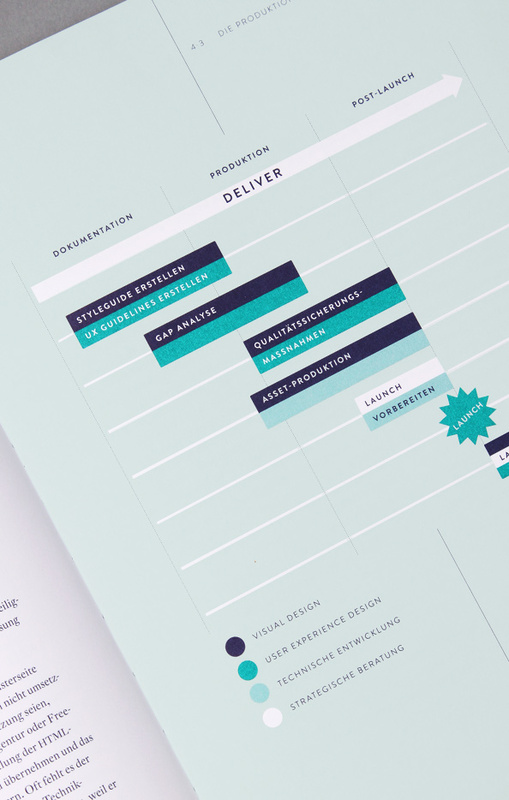 Using a template as a foundation will help you to organize your information and to present it in an engaging way. 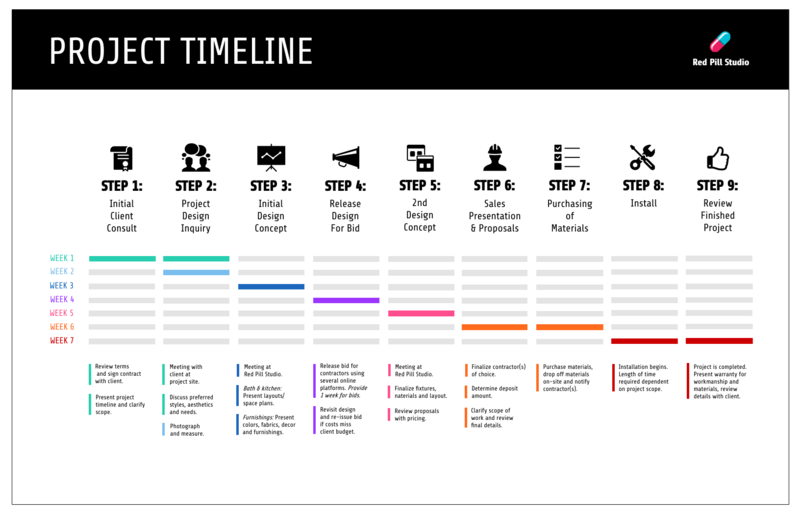 A clear timeline is the backbone of a solid project plan. Confusion related deadlines, and what is required for those deadlines, is a common problem many teams face while working on a project. That’s why it’s important to break your projects down into smaller tasks with staggered deadlines. 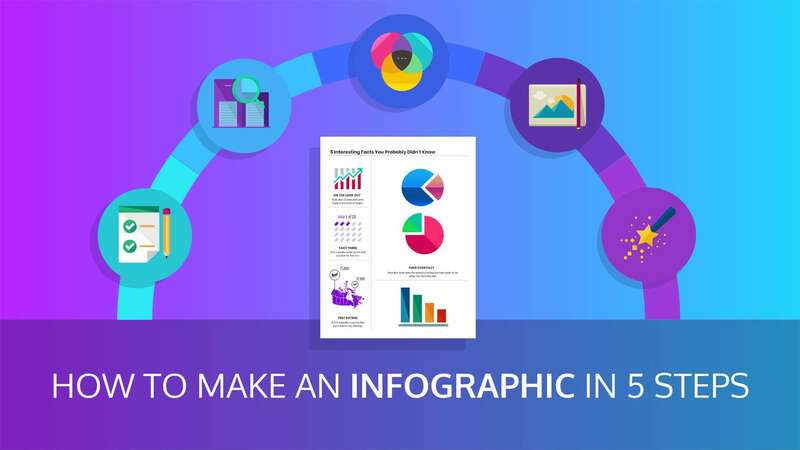 How you actually visualize your timeline will play a big role in how readable and straightforward your timeline infographic is. 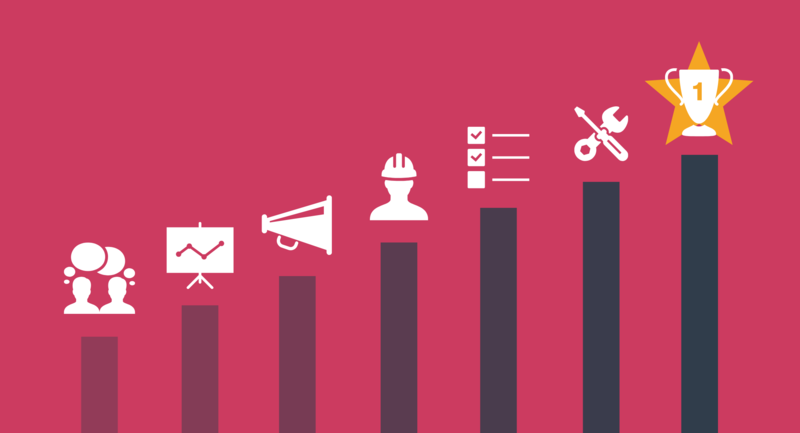 When you think of drawing out your project plan, a Gantt chart probably comes to mind. Gantt charts show tasks over a period of time. This type of chart is handy because it allows you to show different timelines that run concurrently with each other, even if their start and ends dates are different. When you’re first outlining your project timeline, it can be pretty overwhelming. That’s where a visual can help people get a better sense of what needs to be done and by when. 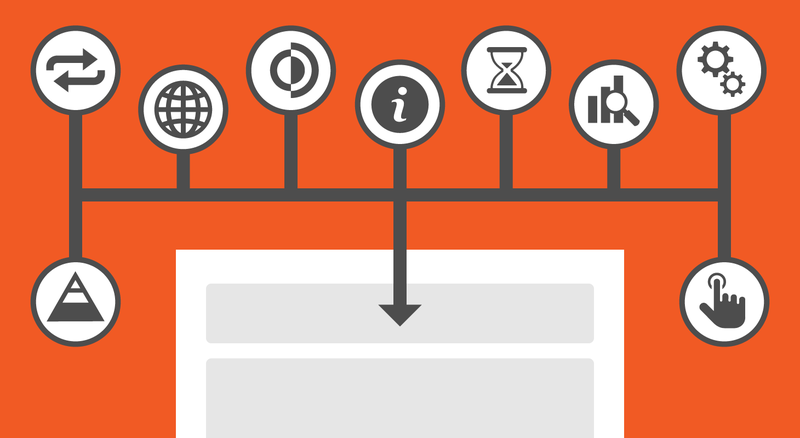 A timeline is a versatile way to visualize milestones, processes, and goals. Because organizing the dates on your timeline can get a bit confusing, I recommend starting with a timeline template. There are a lot of moving pieces that contribute to the completion of a project. It can be easy to lose track of different tasks. A mind map shows relationships between pieces of a whole. Color selection plays an important role in your project plan design. 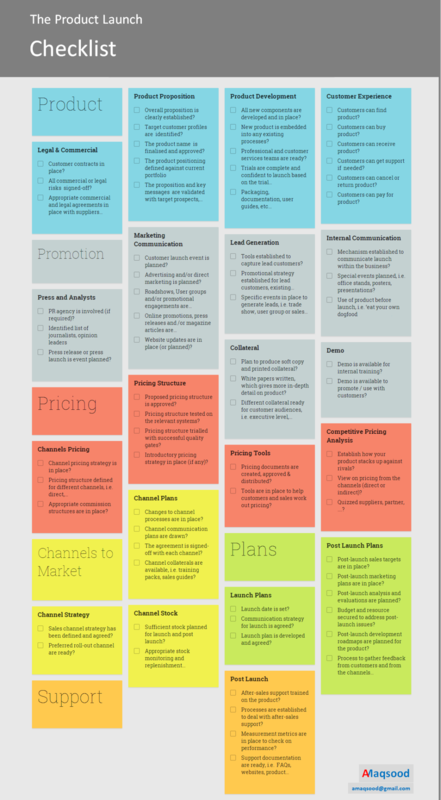 Beyond making your project plan look nice, color can also help you organize and communicate information effectively. For a more detailed explanation, check out our guide to using colors to communicate effectively. 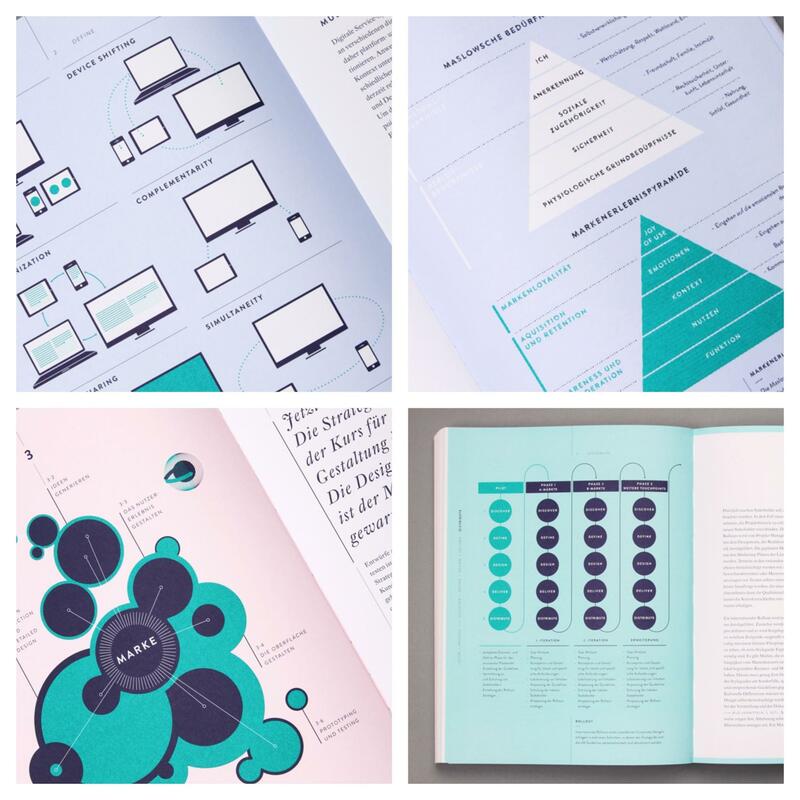 When it comes to designing reports and charts, color is particularly effective for categorizing information. In a project plan, you can use color to categorize tasks by type, week, team involved, and a ton of other ways. Multiple studies have found that people tend to remember images better than words. With that in mind, look for ways to incorporate visual memory-prompters in your project plan design. 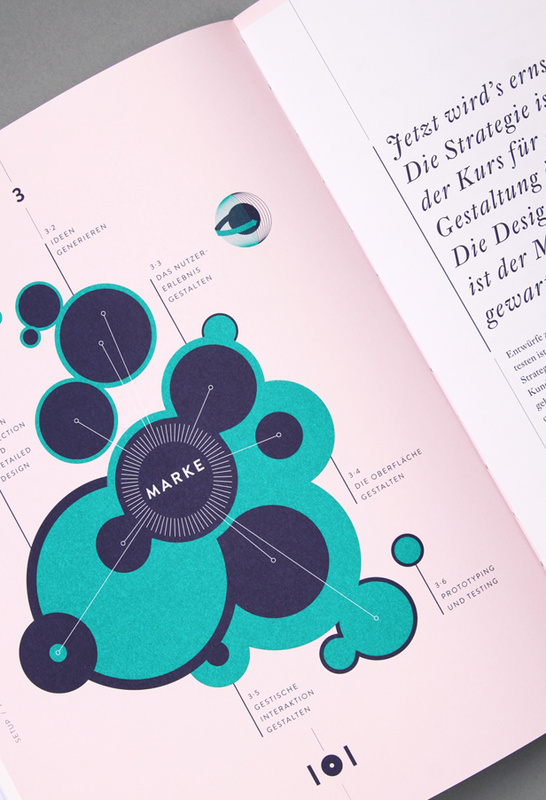 Icons are one type of visual that can be used to make information more memorable. Pair an icon with an important piece of text to help it stand out and stick in the reader’s mind. While your project plan should include the details of your project, offering a visual summary will help keep your team on track. 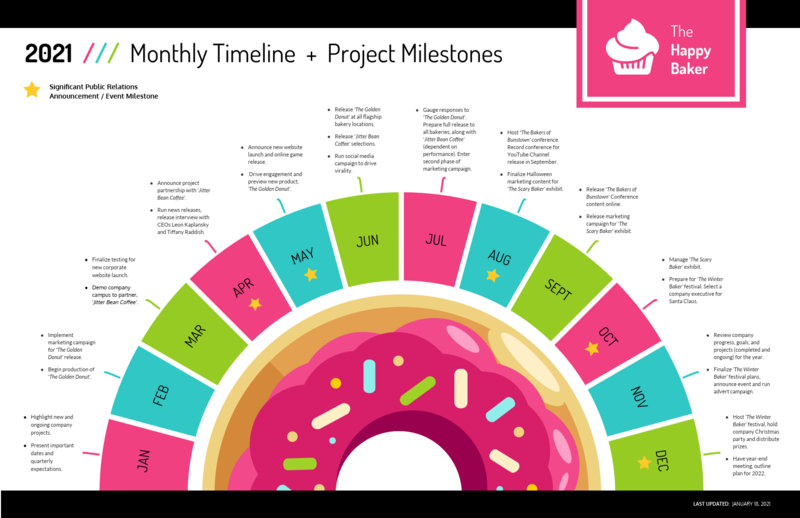 Create a timeline that offers an overview of the phases in your project and the expected beginning and completion dates. 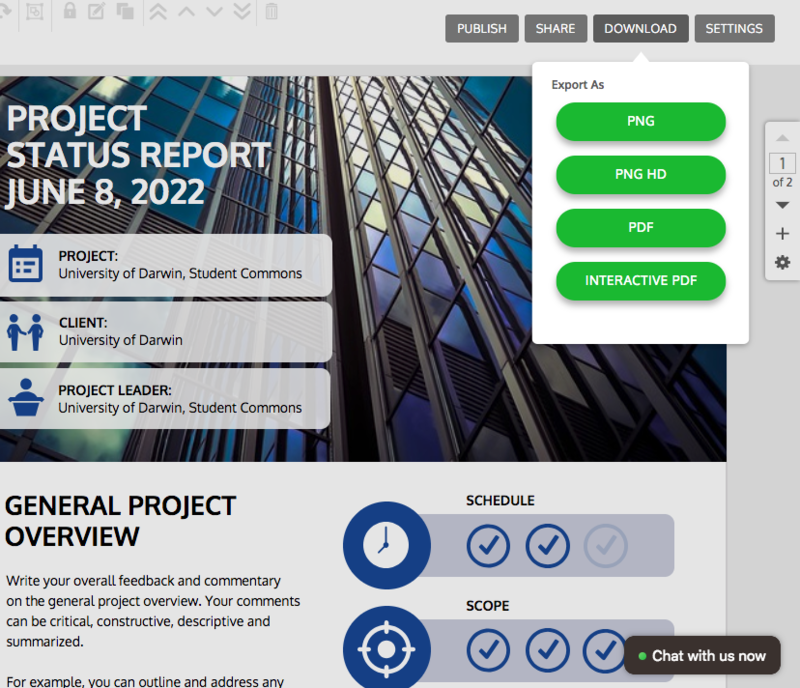 Your team will be able to refer back to the timeline quickly, without needing to read through a bunch of text. Once your team dives into working on a project, there will almost certainly be changes that need to be made to the project plan. Unforeseen obstacles come up, certain tasks take longer to complete than expected, and other snags will happen. That’s why it’s important to not only set your goals, but to also report on your progress throughout the process. 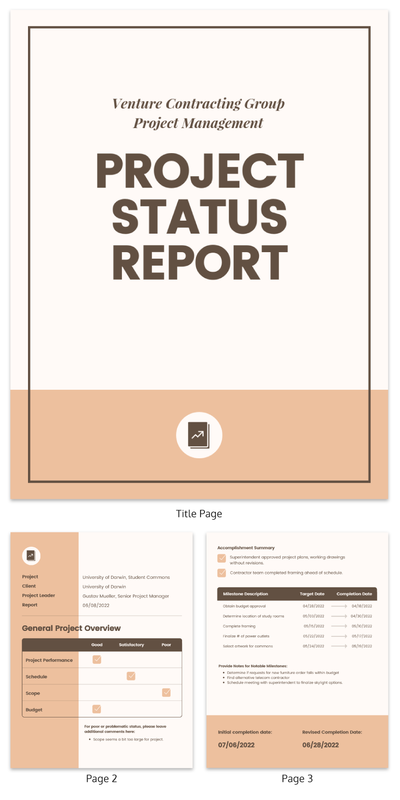 Creating a project status report will help you keep track of your progress, while also communicating it effectively with other parties. While your priority when designing your project plan should be function, finding ways to make your design engaging is still important. After all, your project plan will help inspire confidence in your team–and the people who will be funding your project. Adding surprising design elements will help engage and excite readers. An easy way to do this is to include icons and images that reflect the theme of your project. Certain phases of your project may end up taking more or less time than anticipated. That’s why it’s valuable to track your progress, so you can adjust your goals. Tracking your progress will also help you make informed decisions when planning future projects. You can track your project using a flexible chart that’s easy to update, like the chart templates offered by Venngage. In Venngage, you can create multiple copies of a design. 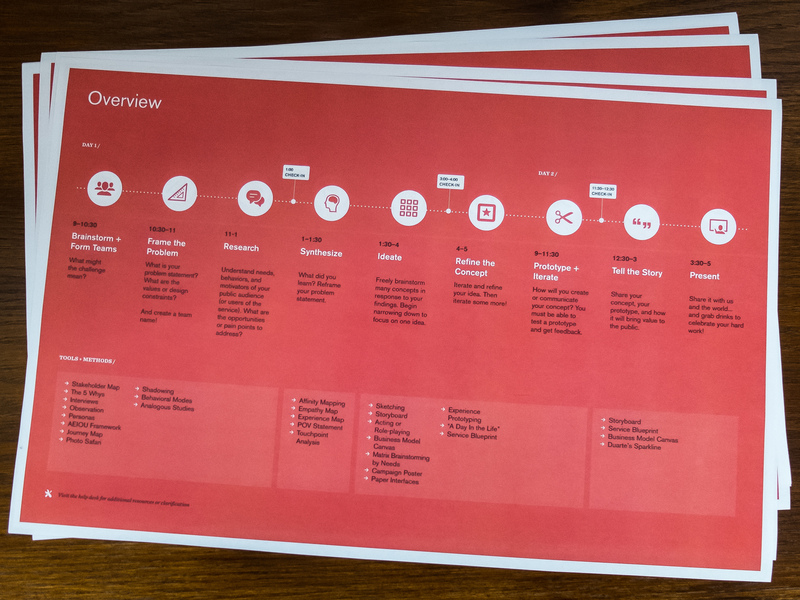 If you’re updating a chart or timeline, it’s a good idea to keep a copy of past iterations. Are there specific dates that certain tasks needs to be completed on? You may want to create a calendar that specifies what should be done on what day. An icon chart uses (you guessed it) icons to represent units of measurement. When coming up with ways to embellish your project plan design, look for opportunities to visualize information that you want to emphasize. 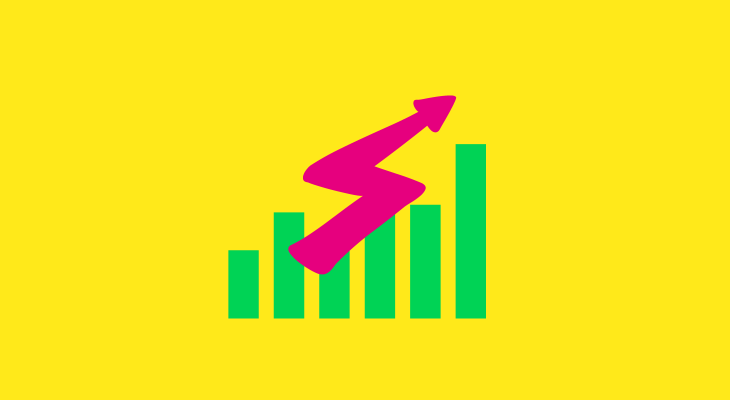 An icon chart is a creative and effective way to do that. When your team is working on a large project it’s sometimes hard to keep everything in perspective. You may have been working on a certain part for so long that you forget what came before it. Or what tasks come after that you need to be aware of. Without all of this information, mistakes will be made and delays are guaranteed. This is where a Next, Now, Later plan can really help your team out. 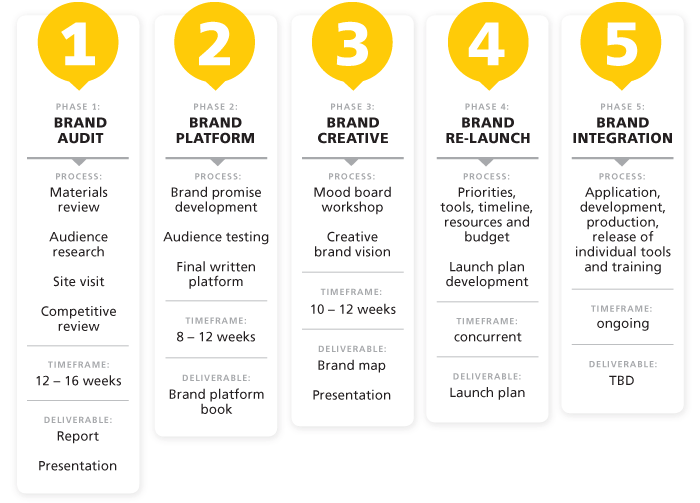 As you can see below, this project plan example keeps each of the steps extremely simple and easy to follow. Plus, it clearly states exactly what this team is working towards with each of their releases. 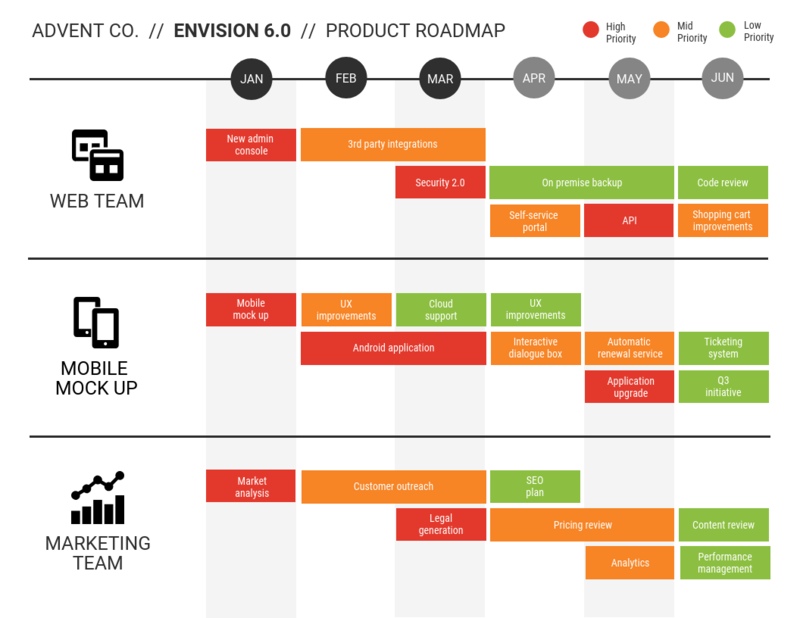 A project timeline plan like this will make it easy for people outside of the main team to see what they are working on as well. Communicating across teams can be a nightmare sometimes, especially as your company continues to grow. It’s common for different people to call a certain thing many names, and that can cause unneeded confusion. Like how people in call a soft drink: “soda”, “coke” or “pop”, but it means exactly the same thing. So assigning common titles for each part of your simple project plan can make communication a bit easier. This common words and phrases will make communication a lot smoother. Now the product team will know exactly what you mean when you say you’re working on the “Sketch” step. 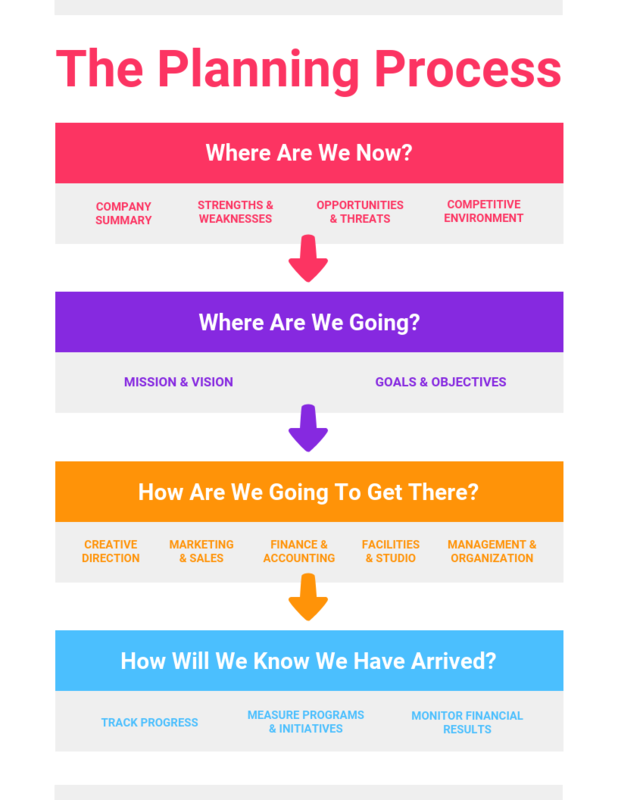 At Venngage we really love using flowcharts in all facets of our planning. These graphics are a solid way to show how a project should progress and how each part is connected to each other. And when your team is working on a complicated process, a visual representation can help you keep it all organized. 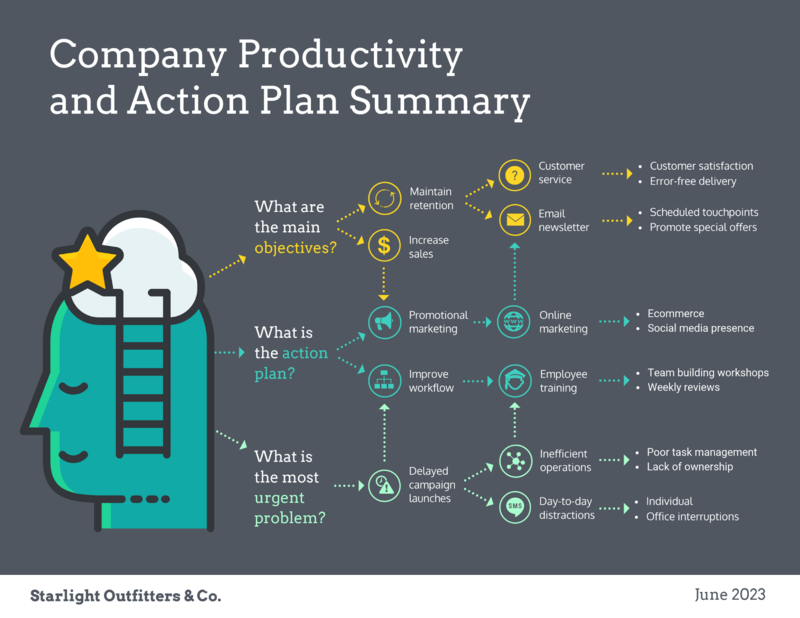 In the project plan example above, they used a flowchart to work through their productivity plan. This approach allowed the designers to show how each step was related, and how it affected the other steps. If they would have just listed all of that information, the relationships between all of it would be lost. Now we would recommend using a flowchart to help explain how a single part works, not for an entire project plan. Actually starting the process is one of the hardest parts of project planning. This is because there’s so much potential, you might not know what to begin with. Your team may have so many ideas, that it becomes overwhelming and unorganized in a manner of minutes. However, with this simple chart, you can kick off the planning in a more structured way. Each step will help you define goals, future plans and a ton of other metrics without getting distracted. 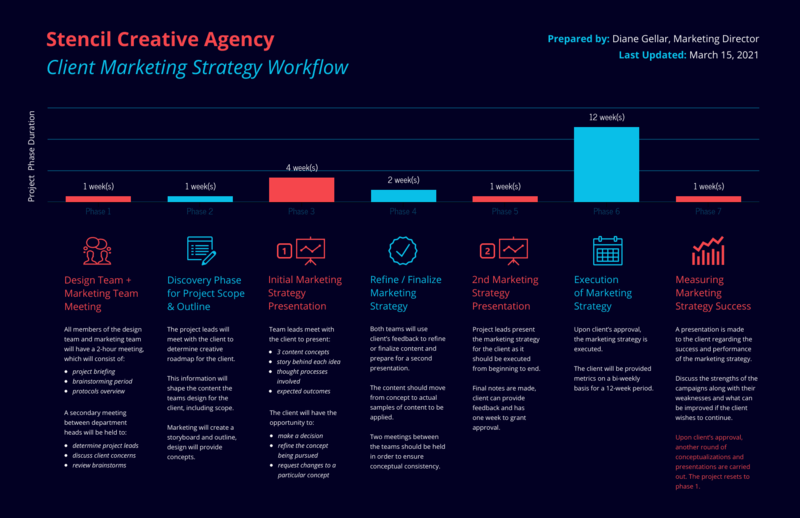 So if you’re not sure where to start, use this chart to get the creative juices flowing! If you want to send your project plan to your team or stakeholders, make it easy for them to open by exporting your file as a PDF or a PNG. 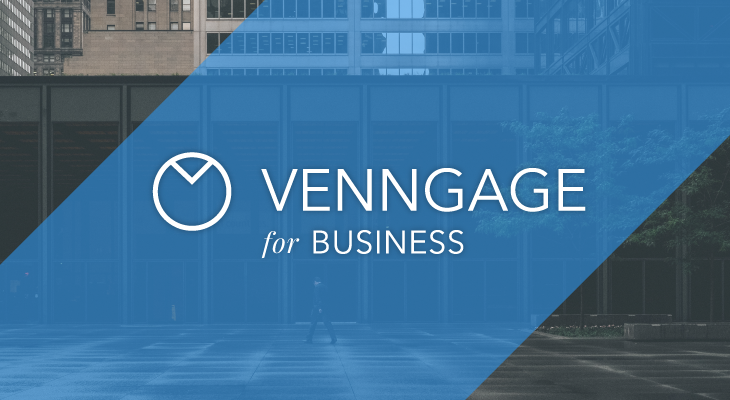 With Venngage, you can download your reports and presentations in interactive PDF format or as a high-quality PNG. With these foundational tips, you’ll be well on your way to creating an impressive–and effective!–project plan. Remember, a well-executed project begins with a solid plan. If you need a little more inspiration for your project plans, be sure to check out some of the examples we found below. 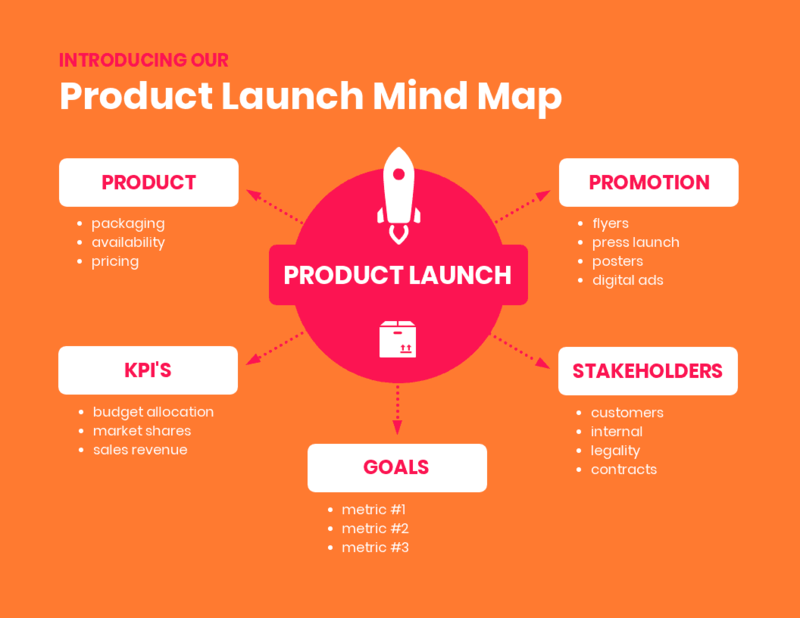 When it comes time to launch your project or product accurately tracking what needs to get done is essential. For a smaller company, it’s easy to keep track of what everyone is working on. But as your brand grows this becomes almost an impossible task. Especially as employees start breaking into smaller teams to tackle a project. 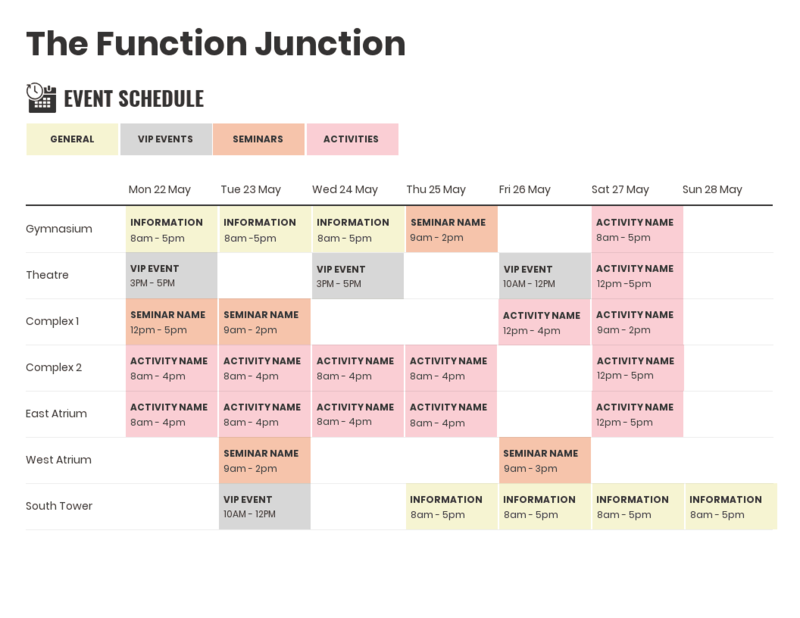 In this project plan example, they use a wide range of colors to break tasks down by teams. This approach will help the managers quickly see what needs to be done next. Plus checking off tasks like this will help each team feel like they are working towards a common goal. You could even print this example off and hang it up in your office so everyone knows exactly what’s going on. As you have seen in this article, there’s not one project plan example that fits every company perfectly. 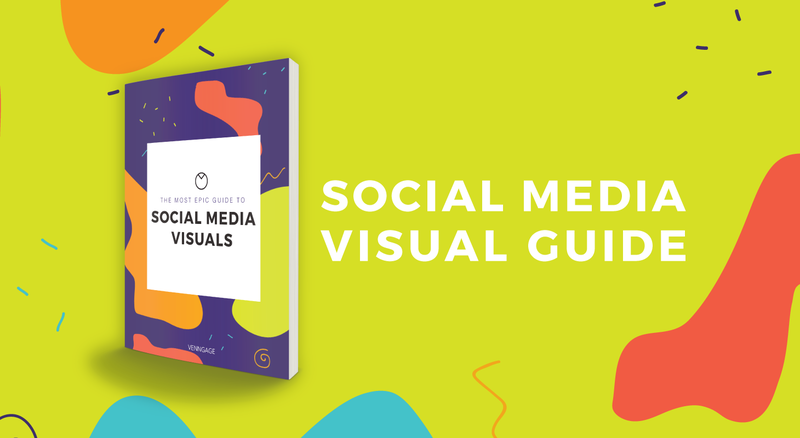 Some simple projects may only need a flow chart, but others could need diverse visuals across a multipage marketing plan. 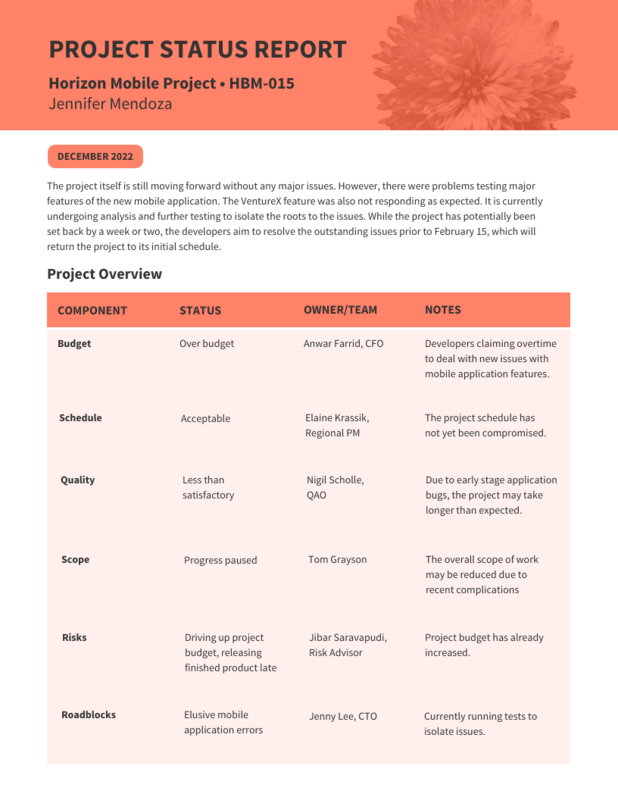 This project plan example is almost a work of art, but it still gets their point across very effectively. Overall, it’s one of the most unique project plans we have ever seen. At Venngage we try to make sure that at the end of each step in our project we have a deliverable to show for it. Otherwise, we are just spinning our wheels and working on things that don’t really matter at that step. A lot of the time, simple project plans fail because they don’t list deliverables or the ones they do are too vague. For example, a good deliverable is very descriptive and has a due date. A bad one is open and never really has an end date in mind. Just remember to be realistic when planning your project, and you will be set. Sometimes telling your team to just go do something is not the best course of action. Especially when there’s is an approaching due date that needs to be met. It’s safe to say that a lot of time will be wasted as they try to figure out where to start. 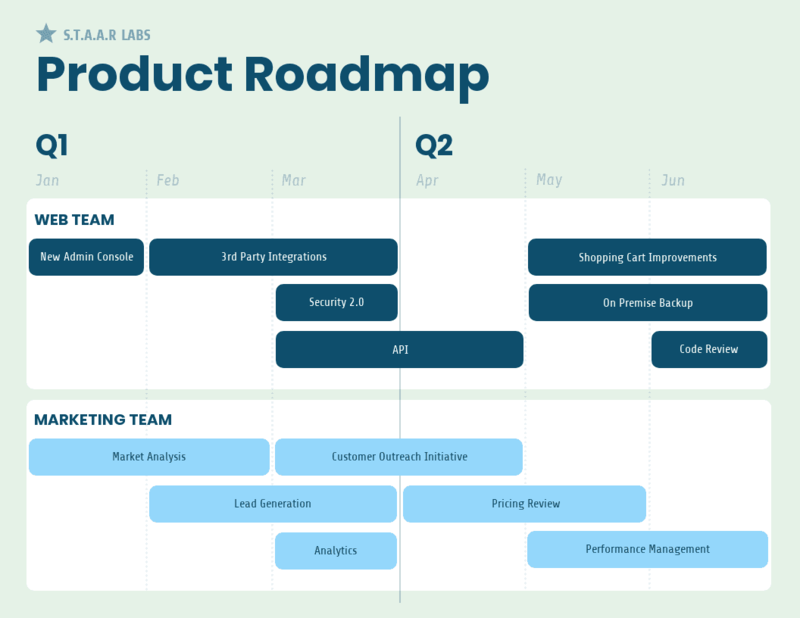 At the bottom of this bold project plan, there are a handful of tools and processes that should be followed at each step. Now, these people can hit the ground running and get their tasks done on time. Instead of wasting half the time searching for the solution or tool that a manager may already have. 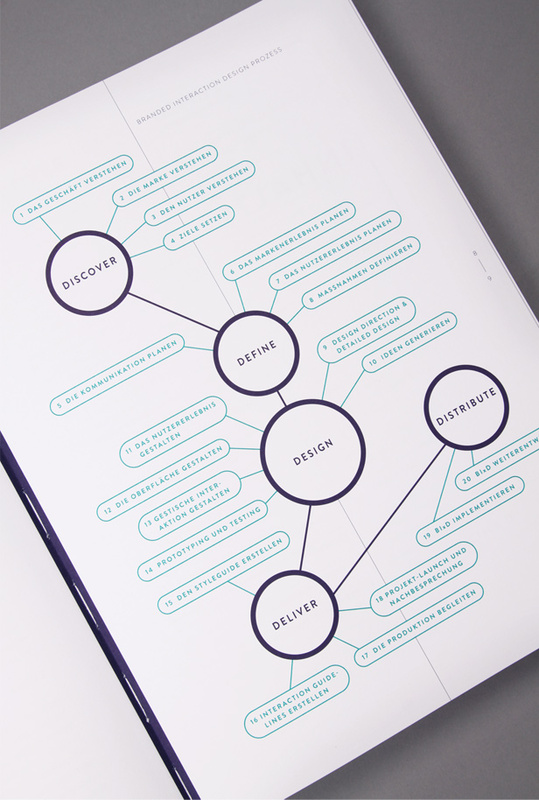 Good design work is consistent, it’s as simple as that. You want each of your graphics to feel and look the same throughout. Otherwise, people are going to focus on the random design elements, instead of your important content. Think about how much a simple misspelling distracted you in an email or presentation. Inconsistent design choices are kinda like typos in the design world. Additionally, this consistency can help you quickly distill info to a reader. Design elements like color, shapes, and icons can add a ton of context to any complex project plan. 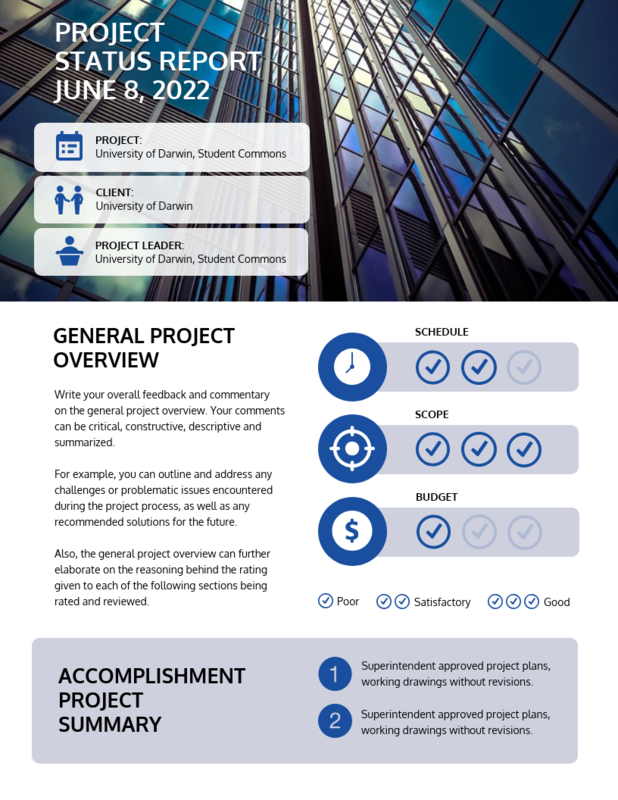 In this project plan infographic, they use colored lines to indicate the answer to a question. Then they added simple flat icons to give each question some supporting info. And a single shape to illustrate the deliverables for each process. This may not be the most traditional project management plan example, but it does get the point across with its many visual elements. Sometimes you’re going to have to present a project plan to people outside the company. These days it might be an investor, a new client or a potential hire. It really doesn’t matter who the person is, you should probably create a simple project plan for these people. And be sure to have it ready whenever you go into a meeting. 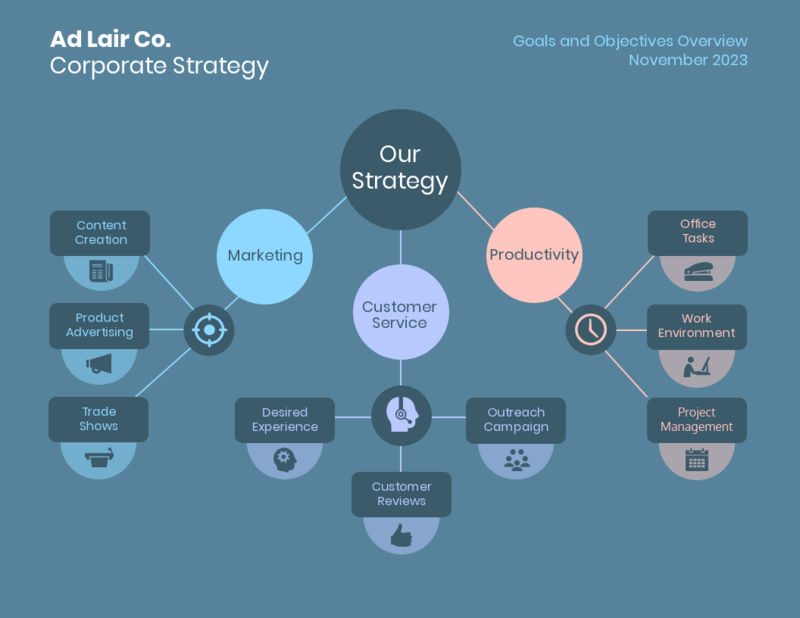 This type of project plan can help you illustrate exactly how the complicated processes your company uses, in a just a few words. They included enough information to explain how they work, without bogging the reader down in unnecessary details. This project plan doesn’t expose any details that could hurt the company or help a competitor as well. Plus you can use a graphic like this to market your company to the world.